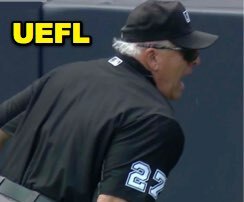 HP Umpire Larry Vanover ejected Mets Hitting Coach Pat Roessler (strike three call; QOCY) in the top of the 3rd and 3B Umpire Hunter Wendelstedt ejected Mets DH Asdrubal Cabrera (check swing strike three call) in the top of the 5th inning of the Mets-Yankees game. In the 3rd, with one out and none on, Mets batter Jose Reyes took a 1-2 fastball from Yankees pitcher Sonny Gray for a called third strike. Replays indicate the pitch was located over the inner edge of home plate and above the hollow of the knee (px 0.825, pz 1.500 [sz_bot 1.47]) and that all other pitches during the at-bat were properly officiated, the call was correct. * At the time of Roessler's ejection, the Mets were leading, 1-0. In the 5th, with two out and two on (R1, R2), Cabrera attempted to check his swing on a 2-2 slider from Yankees pitcher Gray, ruled a swinging third strike on appeal by 3B Umpire Wendelstedt. Play was adjudicated by the UEFL Appeals Board (8-0-1), the call was correct. At the time of Cabrera's ejection, the Yankees were leading, 4-1. The Yankees ultimately won the contest, 7-6. This is Larry Vanover (27)'s first ejection of 2018. This is Hunter Wendelstedt (21)'s sixth ejection of 2018. Larry Vanover now has 0 points in the UEFL Standings (-1 Prev + 2 MLB + 2 Correct Call = 0). Hunter Wendelstedt now has 14 points in the UEFL Standings (10 Prev + 2 MLB + 2 Y-Call = 14). Crew Chief Larry Vanover now has 16 points in Crew Division (15 Previous + 2 Correct Call = 117). *This pitch was located 1.068 horizontal and 2.832 vertical inches from being deemed an incorrect call. These are the 99th and 100th ejection reports of the 2018 MLB regular season. This is the 49th player ejection of 2018. Prior to ejection, Cabrera was 0-3 (SO) in the contest. This is New York-NL's 4/5th ejection of 2018, 1st in the NL East (NYM 5; WAS 3; ATL 2; MIA, PHI 0). This is Pat Roessler's first career MLB ejection. This is Asdrubal Cabrera's 2nd ejection of 2018, 1st since June 9 (John Tumpane; QOC = Y [Balls/Strikes]). 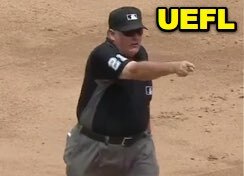 This is Larry Vanover's first ejection since August 12, 2017 (Devin Mesoraco; QOC = Y [Replay Review]). This is Hunter Wendelstedt's 6th ejection of 2018, 1st since April 15 (Counsell; QOC = N [Balls/Strikes]).